Do Paul’s letters agree with the teachings of Jesus, or did he create a new religion? Did he teach Pauline theology and found Pauline Christianity? Did the apostle Paul teach his own brand of religion, a Pauline Christianity? 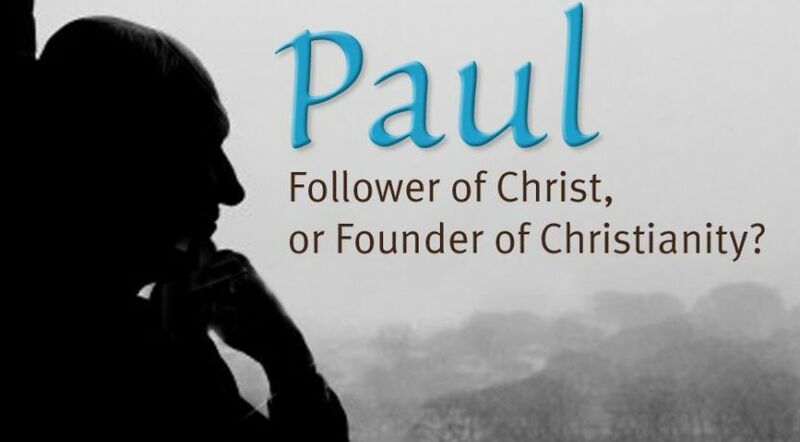 Paul: Follower of Jesus or Founder of Christianity? To many this would seem a very unusual question for anyone to ask. However, this is a serious question that some scholars are asking these days. This is the actual title of a book by David Wenham, a theology lecturer on the faculty of Oxford University. After his dramatic conversion, as recorded in Acts 9, Paul joined the followers of Jesus and, in his own words, became a “slave” of Jesus. Wenham writes, “It is commonly assumed that from this point on Paul’s relationship to Jesus was that of a faithful follower. As a self-confessed ‘slave’ … he was very interested in the life and teaching of his master. He held Jesus in the highest regard and tried to base his own life and teaching on what he knew of Jesus. So it is supposed. “However, that assumption about Paul has not gone unchallenged. Indeed, in recent years a quite different view has become influential. Far from meekly following Jesus, it is suggested that Paul was an innovator who brought into Christianity all sorts of ideas and emphases that complicated and spoiled the original, simple religion of Jesus” (1995, pp. 1-2). Who launched this new thinking? Much credit is given to Karen Armstrong, once a member of a Roman Catholic order, who has written quite prolifically on the topic of religion. She included this thinking in a TV series in the 1980s. In 1986 a book was published by a well-known Jewish scholar named Hyam Maccoby titled The Mythmaker: Paul and the Invention of Christianity. Wenham quotes Maccoby as saying, “It was Paul who founded Christianity” as we know it today. The claim is that Paul, influenced by Greek ideas and the Greek mystery religions, invented the “myths” of Jesus’ divinity and sacrificial death and was also the “creator of the Eucharist” (the bread and the wine also known as communion, the Lord’s supper, etc.) (p. 2). According to Wenham, Maccoby agrees with Karen Armstrong “about Paul’s other unpleasant contributions to Christianity” (p. 2). Many who accept that the Scriptures are God’s inspired revelation to mankind are rightly upset by this unbiblical line of reasoning. The Bible itself claims divine authority and a consistent message. Jesus Himself said that “man shall not live by bread alone, but by every word that proceeds from the mouth of God” (Matthew 4:4). Paul was inspired to write: “All Scripture is given by inspiration of God, and is profitable for doctrine, for reproof, for correction, for instruction in righteousness” (2 Timothy 3:16). For centuries Bible believers have seen the Epistles of Paul and the rest of the Bible as complementary, not contradictory. The Holy Scriptures have stood the test of time, while these modern theories may excite scholars for a time but have no lasting value. Of course, misunderstanding Paul is not new either. The apostle Peter warned his readers that “unstable people twist” Paul’s words “to their own destruction, as they do also the rest of the Scriptures” (2 Peter 3:16). In reality, Paul did not disagree with the teachings of Christ or His disciples. Paul admonished the members of the Church of God at Corinth, “Imitate me, just as I also imitate Christ” (1 Corinthians 11:1). When Paul attended the Jerusalem conference (Acts 15), he acknowledged that James, Peter and John (all writers of the General Epistles) were pillars and of reputation within the Church (Galatians 2:2, 9). He recognized that he was “least” compared with the earlier apostles (1 Corinthians 15:8-9). When those of reputation and pillars in the Church saw that God was with Paul, they “gave me and Barnabas the right hand of fellowship, that we should go to the Gentiles and they to the circumcised” (Galatians 2:9). Christ said to the original apostles, “And you also will bear witness, because you have been with Me from the beginning” (John 15:27). Would these apostles, who were with Christ and taught by Him from the beginning of His ministry, give Paul this authority if they perceived that Paul was teaching contrary to what Christ had taught them? Garry Wills, in his 2006 book What Paul Meant, claims only seven of Paul’s letters are accepted as authentic! He believes two of them were written by others who had a profound understanding of his teaching, one is a clumsy restatement of a genuine one and three of them are clearly not Paul’s (pp. 15-16). It is quite staggering that, almost 2,000 years after the events of the first century, people this far removed can begin to question the authorship of books that have been accepted from the beginning. The Bible tells us that Luke diligently sought out the facts about the early Church and its establishment to give an accurate report to a man he calls “most excellent Theophilus” (Luke 1:1-4). This same Luke records in Acts 9:10-16 how Christ showed Paul what things he must suffer for Christ’s name’s sake. Throughout the rest of the book of Acts Luke records the travels and the trials of Paul, including his interaction with many of the people his epistles are written to. Do the Pauline epistles belong in the Bible? “One thing must be emphatically stated. The New Testament books did not become authoritative for the Church because they were formally included in a canonical list; on the contrary, the Church included them in her canon because she already regarded them as divinely inspired, recognizing their innate worth and generally apostolic authority, direct or indirect” (1981, p. 22). Dr. Bruce goes on to say that the councils of Hippo Regius in 393 and Carthage in 397 codified what was already the general practice of those communities. He gives further evidence on this subject of canonicity and biblical authority in three other books: The Books and the Parchments, The Spreading Flame and Tradition: Old and New. There are many who believe that the early Church had accepted the 27 books of the New Testament before the apostle John died in the 90s. Had John or the other early apostles and leaders found that the apostle Paul had added “unpleasant contributions to Christianity,” surely they would have left his writings out. Let us express faith in the God who created all there is and rest assured that He had and has control of what He inspired His chosen writers to record. The Scripture cannot be broken (John 10:35), and Jesus told His disciples that the Spirit would guide us into all truth (John 16:13). We believe that God has kept that promise. The apostle Paul was inspired to write and teach what he did, in total agreement with the teaching of Jesus Christ. He did not create a Pauline Christianity—though others, twisting his words, have indeed developed unbiblical versions of Christianity. To correctly understand Paul’s epistles and doctrine, we need to pray for the proper understanding of what God said to us through his writing.